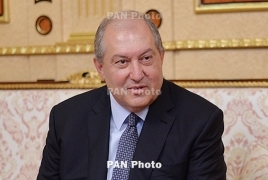 PanARMENIAN.Net - President Armen Sarkissian has congratulated his Syrian counterpart Bashar al-Assad on the National Day of Syria. Syria’s national holiday is traditionally referred to as Evacuation Day, which commemorates the evacuation of the last French soldier and Syria's proclamation of full independence and the end of the French mandate of Syria on April 17, 1946. In a message sent on Wednesday, April 17, Sarkissian expressed confidence that the strong Armenian-Syrian ties formed throughout centuries will continue to develop and deepen to benefit peoples of the two countries. "I hope Syria will ultimately overcome the current crisis, and the Syrian people will enjoy lasting stability and progress," the Armenian President said.